Dragon1 is specialized software for Enterprise Architecture Modeling and Design. On this page we provide a tutorial to create an EA Blueprint. First, we introduce a bit of the open Dragon1 EA Method theory about creating an EA Blueprint and next we layout the steps to create an EA Blueprint on the Dragon1 Platform. What is Enterprise Architecture and what is its function? What is an EA Blueprint and why do we create one? What are the main tasks of an enterprise architect? How to create an Interactive EA Blueprint on Dragon1? As an architect you normally are required to create landscapes, blueprints and roadmaps for your stakeholders. Therefore Dragon1 is optimized to create these three types of visualizations. Dragon1 has, as part of its EA Method, defined an open EA Framework containing reference models and architectures. The five most important blueprints have been named The Big Five, out of which the EA Blueprint is the most important one. And that one we are going to discuss here. Before creating an EA Blueprint, be sure to start with the first tutorials as advised on the Jump Right In page of the Getting Started area. Why create an EA Blueprint? There are many different types of organizations like enterprises, companies, schools and governmental bodies. All these are organizations because they are groups of people using means and resources to achieve goals together. The better you know how the people, means and resources are organized, the better you can manage them to achieve goals. With managing we mean: settings goals, checking progress and (re)directing projects or work. Organizations, though, often are lacking overview and dependencies of the structure. This because organizations are constantly innovating and adapting to their changed environment (in terms of changing client needs, technology and legislation). A blueprint is a best practice for creating overview and insights in the presence of interrelationships or dependencies between the parts that an organization consists of. 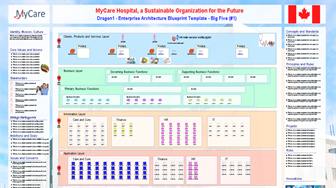 Enterprise Architecture as a field of work and the Dragon1 open EA Method look at organizations as fluid systems. At logical level systems consist out of elements. There is not one second that the organization is the same as another second. All elements in the system are directly or indirectly connected with other elements. This means that if you are going to change elements in the organization, you will change more than the direct structure. You will also change related parts you did not intend to or want. Or even the other way around, other parts can block or frustrate your intended change. Knowing how an organization exists of elements and how they are related, is knowing about the structure of the organization. It is a physical (technical) or logical (functional) level view of the organization. But when you know how groups of elements work together as a concept producing results, then you know out of what concepts (and their principles) the organization consists of. In other words, then you know the enterprise architecture of the organization. Why is this important to know? Well, if you change an element (at the logical level) or component (at the physical level) you might either be disturbing or enabling the group collaboration of elements (i.e. the principle of a concept). Suppose your organization is printing books, but the newly bought clean recycled paper is thicker than the previously used paper. Then the printing may not succeed with the current printers and also new printers have to be bought. So the new paper disrupts the current organizations printing principle: By always using cheap and thin paper we can make use of any low-cost printer and produce a huge amount of books for profitable prices. As an architect you can be of great added value by communicating about the current state of concepts and principles and what new concepts and principles are needed by the strategy and how transformation affects concepts and principles in the organization. In other words: You definitely should create an Enterprise Architecture Blueprint to increase your added value. The Dragon1 open EA Method defines architecture as a special total concept for a structure, like an organization. And the architect is defined as a designer of that total concept and the supervisor of its realization. So in order to create an EA Blueprint, the architect must select and group concepts. But to know what concepts an organization needs, an architect must know where architecture fits in the governance of the organization. Architecture is defined by Dragon1 as the Bridge between Strategy and Transformation. So any total concept (=architecture) makes sure that the right transformation is carried out to enable the strategy. And architecture provides an integral design or blueprint for all the programs and projects that carry out the transformation. With this, he collects, selects, groups amd modifies and adapts concepts because they are required by the strategy. On an EA Blueprint, an architect draws the concepts, principles, their elements and or components as an integral design. The parts are often grouped in layers and domains. In an EA blueprint, it is common to visualize the layers: market & client, governance, business, information (or data and application) and technology or any combination of these layers. The layers are filled with the elements or components that come from the concepts. Like process, function and unit in the business layer. Next, the architect defines the parts of the transformation: Programs, projects, stages, phases, milestones and deliverables. So before starting to create an EA Blueprint on Dragon1, it is a good thing to know all this: Why, What and How to create an EA Blueprint. Here are the steps to take in the Visual Designer to create a blueprint. Below you will see a screenshot showing an example blueprint that can be used by you as a template to edit. You can, of course, create a separate Strategy and Transformation blueprint or create a solution blueprint or roadmap for a certain project or solution. Also you can create an AS-IS Blueprint or TO-BE Blueprint and define the GAP between them and present that GAP. Anyway there are lots of things to do once you have created an EA Blueprint. Publish the blueprint to the Content Viewer and share it with your stakeholders. Ask them to add comments in the Content Viewer. Process the comments to improve the blueprint. Educate the stakeholders where they can use the blueprint for and how to use it. The next time you want to create an EA Blueprint use this blueprint to get a design assignment from a director, being your owner/client as an architect. Below we are detailing all the steps from above. Create an enterprise model that contains all the data or create several models that together form and enterprise model. We now have data, a model and views. And these views in the end need to be made visible on a visualization canvas to form a visualization. So first we are going to create a visualization canvas. A Visual Item is a shape/data placeholder that is placed on a visualization and linked to a view. The Visual Designer will interpret the rule configured in the visual item in Normal Mode to show the data of the linked view on the visualization canvas. Draw per view a visual item on the Visualization. It is a good practice to draw the Visual Item containing a background color, at the exact place where you want the data of the view to be generated on the visualization canvas. The visual items need to be linked to the views. Make sure you have done this. Now the visual items will be interpreted and, if all setting are done correctly, will show the data of the views at the correct position. If you want to add interactivity to your EA Blueprint, you can do the following. You can have Popup Dialog Boxes be generated on mouse over or mouse click on a shape. And you can insert clock through links from this blueprint to other visualizations. For instance to go to a detailed visualization of a process or application, if you click on it. A third standard piece of interactivity is tracking and tracing. For tracking and tracing you do not have to do anything extra. Via the switches on the playerbar in the Visual Designer and in the Content Viewer you can switch tracking and tracing on and off. This is a screenshot of the EA Blueprint. This EA Blueprint is also available as template in the Visual Designer. This blueprint is only a reference model. Be sure to adjust it to your specific needs.